search terms: bodypure, detox, detoxify, toxins, kinotakara, shu li, toxic, metal-free, detoxify, shu-li, DMPS, DMSA, cleansing, foot patch, chelation, toxicity, sap sheet, heavy metal detoxification, internal cleansing, Benzene, Asbestos, PCA-Rx, DetoxiPad, toxin removal pads. Bodypure-detox detoxify toxins kinotakara shu li toxic metal-free detoxify shu-li DMPS DMSA cleansing foot patch chelation toxicity sap sheet heavy metal detoxification internal cleansing Benzene Asbestos PCA-Rx DetoxiPad,toxin removal padsBodypure-detox detoxify toxins kinotakara shu li toxic metal-free detoxify shu-li DMPS DMSA cleansing foot patch chelation toxicity sap sheet heavy metal detoxification internal cleansing Benzene Asbestos PCA-Rx DetoxiPad,toxin removal pads bodypure, detox, detoxify, toxins, kinotakara, shu li, toxic, metal-free, detoxify, shu-li, DMPS, DMSA, cleansing, foot patch, chelation, toxicity, sap sheet, heavy metal detoxification, internal cleansing, Benzene, Asbestos, PCA-Rx, DetoxiPad, toxin removal pads. BodyPure®+. The number one selling product in Japan in its class 12 times in a row!! The Japanese have been using this product to combat fatigue, improve circulation, increase metabolism, enhance quality of sleep, help release toxins and as a general practice to stay healthy and clean. Our BodyPure®+ pads are effective, made of 100% natural ingredients and easy to apply. Click here to see an example of BodyPure®+ pads in action (before and after application). WOOD VINEGAR AND BAMBOO VINEGAR EXTRACT. The quality of our product is based on the purity of the Vinegar extract. The extract used in BodyPure®+ is condensed five times and contains no synthetic vinegar or starch. After the initial extraction process, the extract is dried for a period of six months. It is then filtered four times using the highest quality Umbamegashi-Binchou Charcoal . It is then dried one more time for an additional six months before it can be considered for use. This process yields a very concentrated extract with an extremely high level of purity. The plant is found in Japan, Java and Nepal at altitudes of over 6200 feet. It contains a variety of flavoids, flavonoid glycosides (afzerin, quercitrin, isoquercitrin) and pyridine alkaloids; the essential oil was found to consist mainly of decanal (capry aldehyd), dodecanal (lauryl aldehyd) and 2-hendecanon (methyl nonyl ketone). Since ancient times it has been valued for it absorption properties. The Loquat leaf contains malic acid, tartaric acid, citric acid, tannate, carotene, vitamins A, B and C. It's leaves and kernel contain amygdalin (amygdalin is otherwise known as vitamin B17, or laetrile). It promotes the secretion of body fluids and has antitussive, expectorant, antiemetic properties. It has 3000 years of history in muxibustion therapies and has been used extensively in Buddhist medicine. In India it has been called the king of herbal medicine. The name apparently comes from the Sinhalese word "Turamali" which was given to mixtures of unidentified gem gravels in Ceylon (now Sri Lanka) Tourmaline exerts a cleansing and liberating energy upon our entire nervous system with a clearing and stabilizing effect. Tourmaline is best know as one of the only minerals to emit far infrared heat - which causes resonance in the body at the same frequency as water. Click here for more information on Far Infrared. A powerful and natural absorbing agent, diatomaceous earth can generally absorb up to 100% of its own weight in liquid and still exhibit the properties of dry powder. In fact, it's absorbent qualities make it useful for spill cleanup (the U.S. Center for Disease Control actually recommends it to clean up toxic liquid spills). Diatomaceous earth is a natural occurring siliceous sedimentary mineral compound, and has a soft, chalk-like feel to it. Often used in aromatherapy to clear the mind, citronella also posseses potent anti-bacterial and deoderizing qualities. Native to Sri Lanka and Java, this aromatic perennial (once extracted) has a softening effect on the skin, and helps to combat excessive perspiration, making it ideal for use on the feet. Dextrin is a product of starch hydrolysis, a carbohydrate having the same general formula as starch but a smaller and less complex molecule with adhesive properties. Many people are skeptical about the ability of a pad on the sole of the foot to have any kind of systemic effect. Of course, once you try it and see for yourself it is evident to most of us. In order to understand how it works, begin by looking at the picture below. Note how the central- anterior area of the sole of the foot corresponds and connects to the kidneys, liver, and spleen. If you have any doubts about the connections of the sole of the foot with our organs, I invite you to try the following simple experiment. If you are not allergic to garlic, cut a clove in half and rub the fresh garlic side on the sole of your foot (for approximately 45 seconds). Within a few minutes, you will be able to detect a garlic taste in your mouth! Now that we have established the connection, we can understand how the ingredients in BodyPure®+ use their natural power of absorption to “draw out” the toxins that are utilizing the existing channels of our body. Trees are natures specialists in mobilizing nutrients, energy and toxins up and down the trunk (from the roots up and from the leaves, after photosynthesis, down). When toxins are absorbed into the system, most become embedded in our tissues. As the BodyPure®+ pads are placed on our skin, the natural herbs interact, and begin their work by emitting far infrared energy. Click Here for more information on Far infrared. The infrared rays not only enhances the cells functions directly, but also stimulate the Kidney 1 Meridians on the soles of the feet, creating a second front for detoxification. The Kidney 1 Meridian is used extensively by Acupuncturists and Acupressurists to also promote healing and relieve tension. In essence, the BodyPure®+ pads gently stimulate this point for an 8 to 10 hour period. Click Here to see the location of the Kidney 1 Meridian on the sole of the foot. #17 (or the right kidney point) is what you are looking for. In addition, the wood vinegar extract in the foot patches allows for a phenomenon known in Asia as the "minus ion effect". By creating an osmotic shift in the herb/skin interface it permits the transfer of toxins. This "minus ion effect" induced by the pads, accelerates the natural excretion process (through the pores), and allows the body to purge toxins at a faster rate. So where is the proof? 1) The visual evidence after using the BodyPure®+ pad is compelling. The progress is apparent when used over a few consecutive days. 2) Multiple samples of pads were sent to SRC Analytical Lab, a highly accredited Environmental Laboratory. The results demonstrated absorption into the patch of Nickel, Arsenic and Mercury amongst others. 3) Multiple pads for various individuals were analyzed by using a syncrometer. The syncrometer, an electronic device used to detect individual substances by using a circuit and matching frequencies. The following substances have been identified in the used pads through this method: benzene, isopropyl alcohol, methyl alcohol, aluminum, cadmium, copper, lead, mercury, nickel, thallium, arsenic, asbestos, DAB dye, fast green dye, sudan black dye and PCB (plastic byproduct). 4)Hair analysis testing of toxin levels in individuals before and after the use of the BodyPure®+ foot pads have been conducted. To see an example Click Here. 5) Extensive research in Japan have been conducted with the use of Thermography (infrared technology). The pads have been tested for their ability to stimulate circulation by means of these thermographic sensors. Please refer to figure below. 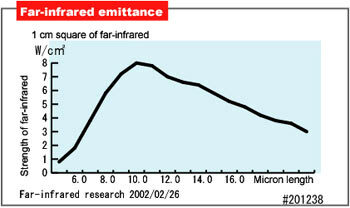 Click here for more information on Far Infrared. Why do we need to detoxify? Toxicity is rampant in our modern world. We are surrounded by toxic chemicals and pollutants. Click here to see the signs and symptoms of toxicity according to detoxification expert Elson Haas M.D. Click here for a list of contaminants and their sources. Invariably these toxic waste and pollutants lead to disease. We, of course, shower or bathe, wash our hands, rinse our mouth, and brush our teeth on a regular basis. Hygiene is essential in maintaining our health! If we neglected our body by not keeping it clean, we would soon find ourselves accumulating offensive agents leading to disease. But how do we keep the inside of our body clean? We do accumulate toxic and unwanted matter every day inside our bodies, in our bones and muscles, in our fat and in our organs. Physicians have known for centuries that health problems can result from the accumulation of foreign substances in our bodies. However, human exposure to toxins has reached alarming levels. Millions of chemicals have been produced and thousands are now used commercially every day. Many of these chemicals find their way into our bodies through our water supplies, the air we breathe, the food we eat and the cosmetics we use. In addition to commercial substances, many drugs, pharmaceutical and recreational can remain in our bodies for a very long time. Caffeine, nicotine and alcohol can further contribute to our body’s contamination. The United States Government’s Environmental Protection Agency has now officially put out warnings on many of these aggressors, including specific caution on the consumption of fish leading to mercury ingestion. California’s Attorney General has filed a lawsuit “against five grocery store Companies for failing to warn consumers that the fresh and frozen fish they sell exposes them to mercury, a chemical known to produce cancer and reproductive harm”. In addition, Dentists are now required by law to disclose the potential dangers and risks of amalgam restorations (“silver fillings”). So what is the solution? Well, in an ideal world we would simply eliminate all those agents that are causing toxicity and disease. But realistically, if we are to live and stay healthy in this post industrial revolution era, we must detoxify our bodies at least at the same rate as we are being contaminated. This cleansing must be part of our routine to get us back into balance, healing and breaking long term congestion. "Keeping our bodies clean inside and out prevents disease and premature aging" (according to Dr. Hans Krugler, President of the International Academy of Anti-Aging. he has been instrumental in finding the relationship between toxins and premature aging and the need to detoxify). Helping our body detoxify can be done in many ways. Some experts recommend intestinal cleansing and fiber in our diet, others, using anti-parasite herbs and others using diets and fasts. All of the above, when used under the guidance of a professional can be immensely helpful. The greatest challenge, however, is how to remove from ourselves some of the toxins that stubbornly attach to our tissues, such as heavy metals (arsenic from our water, mercury, lead, etc.). In the past, if we wanted to decrease toxic levels of mercury (from dental amalgams and fish consumption), arsenic or lead for example, we had to undergo a process called chelation. Chelating agents such as the Sulfhydryl-bearing agent DMSA was intravenously injected. Other chelators such as DMPS have also been used. These agents had to be used repeatedly until levels of the toxins were reduced. Disadvantages of this protocol are discomfort of the injection, high cost ($100.00 per shot is not uncommon), and according to James Landler M.D. possible bone marrow suppression, liver toxicity and a heavy load placed on the kidneys as the toxins are excreted. A much simpler yet effective way to rid of our toxins is a modern application of traditional Japanese Medicine. A simple BodyPure®+ pad (similar to those used for pain, insulin or nicotine delivery) is placed on the bottom of the foot. The patch contains natural ingredients that stimulate and draw out toxins while we sleep. Next morning, by simply removing the patch we can actually see some of the material that has been “suctioned” out. You will be pleasantly surprised to see the dramatic results. But don’t just take our word, call (888) 951 PURE and try it yourself. If you do not agree with us that these pads deliver results, just return the unused pads and get your money back. No questions asked! And now, with your order, you can send a free sample of our product to the family member or friend of your choice. Just give us their mailing address when you call in (or respond with that info to the email confirmation of your order) and we'll be happy to send them their free sample. Congratulations, you are on your way to better health.